Each morning, I go out to the front yard to pick up the thin remains of what used to be the mighty Los Angeles Times. We’re one of the two or three families on the block who still subscribe to a paper that once was a powerful influence in shaping the political, cultural, and societal agenda for this neighborhood and others spreading outward from urban Los Angeles, through the suburban San Fernando and San Gabriel valleys, and into Orange County. Television was just as important. “From the desert to the sea to all of Southern California,” is how the great anchor Jerry Dunphy grandly described his turf when he opened his nightly newscast, first on KNXT (now KCBS) and then KABC. Television, the Times, and other publications voiced the triumphs, aspirations, and fears of Southern Californians. They also recorded our disasters. Although we had other things in common, we were really held together by what we saw on the home screen and read in the newspaper. Today, producers, editors, and reporters in L.A. understandably share one aspiration—hang on to their jobs and their audiences as best they can. But, just a few decades ago, media aspirations were grander—to reflect the tastes, hopes, and dreams of a booming Southern California and provide its residents with information they needed for their daily routines. If we accomplished that task, those of us in the news business felt our papers and stations would prosper. 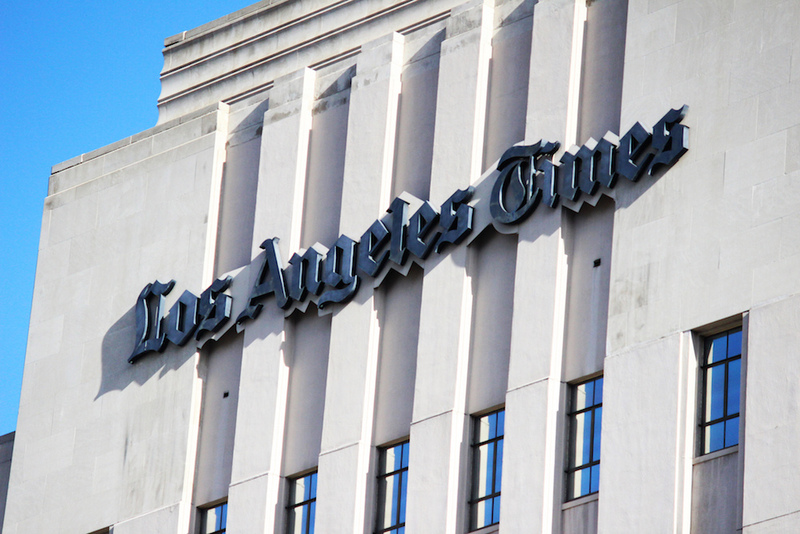 I came to the Los Angeles Times in 1970 and worked there for more than 30 years as a reporter, bureau chief, columnist, and city editor before I retired in 2001. Several months before I left, the paper was bought by the Tribune Company, which lately has spun it—and the parent company’s other newspapers—off to an entity called the Tribune Publishing Co.
My colleagues and I felt a civic responsibility to our more than one million Southern California readers. So did the TV stations and our smaller newspaper rivals, the Herald Examiner and the Daily News. The media were deeply connected to Los Angeles by the beats the reporters covered and by getting out of our chairs to complete assignments around the city. Going to community meetings, trudging through every neighborhood in Los Angeles, covering city council campaigns, and visiting schools made me feel I was fulfilling my obligation to my readers and the people I interviewed, who often were the same. My ability to think and work that way represented progress. The Times’ early proprietors, Gen. Harrison Gray Otis and his son-in-law Harry Chandler, also believed the paper had a civic role—to run the city in a way that would permit them and their cronies to enrich themselves. Their paper filled its news columns with slanted stories promoting the two enterprises necessary to achieve their economic goals. One was a harbor open to all, free from the clutches of the monopolistic Southern Pacific Railroad. The early-day L.A. oligarchs used the paper to persuade Washington to give Los Angeles the federal money needed to begin construction of the harbor in San Pedro. The second was a reliable source of water to permit development of the Los Angeles basin. The mayor, Fred Eaton, found a source of water in the Owens Valley, on the eastern side of the Sierra. Los Angeles’ leaders, including Otis and Chandler, came up with a plan to import the water to the city. In the process, the Times owners and other businessman formed an investment company that bought 16,000 acres of the San Fernando Valley, land that would be irrigated by Owens Valley water. I guess you can’t say that Otis or Chandler lacked civic ambition. Are the old aspirations of media that can connect Southern California dead? Not entirely, because Los Angeles recently experienced a revival of the old media spirit, and we were reminded of how much we’d missed it. The paper Chandler put out in those days was a narrow right-wing rag, catering to a core readership of Pasadena WASPS. Blacks, Latinos, Jews, and Asians weren’t part of the paper’s news coverage. Reporting on persecution and segregation of minorities was slanted or nonexistent. A brutal, racist police department was supported, even encouraged. In return, the cops kept the clamps on union organizing, pleasing Chandler and the business establishment. It was World War II that changed Los Angeles and its media. The wartime industry was transformed into the aerospace business, and the machinists union became a political and economic power. So did the United Auto Workers, which had organized a growing number of auto plants. Returning vets crowded into USC and UCLA. And almost everyone—the ex-GIs, the unionized factory workers, the white collar people—shared the aspiration of owning new homes of their own in the suburbs of the San Fernando and San Gabriel Valleys, as well as Lakewood and other communities on the old farmlands south of downtown Los Angeles. By then, Norman Chandler, Harry Chandler’s son, was publisher and he wanted to reach those middle-class and working-class residents, including minorities, whose numbers had increased during the war. He started an afternoon paper, the Mirror, to do that. Television, for similar reasons, came up with KNXT’s Big News, an hour-long dinnertime broadcast with a hard news slant, but also with features covering a very wide range of subjects to appeal to viewers of all classes, races, and ethnic backgrounds. Unfortunately, the Big News didn’t last, and the Mirror was a money loser that Chandler closed. But its spirit would be incorporated into the Times when his grandson Otis Chandler, took over in 1960. If his grandfather’s aspirations could be reduced to a dollar sign, Otis Chandler’s were big enough to fill a map of the state, the country, even parts of the world. He saw Los Angeles as a center—even the center—of world commerce and culture, dominant in the Pacific Rim, with an influential voice in Washington and Europe. Fueled by the scorn with which other big-time publishers had treated the Times, he was determined to make it the nation’s premier newspaper. It was a paper with something for everybody—sports, culture, foreign, national, Washington, and local news; fashion; pages of comics; and more. Working there in those days was like playing for a top major league sports team; reporters even flew first-class. Chandler ditched the right-wing slant of political coverage, and the paper began treating politics and government in a more objective manner. He expanded the circulation beyond the old Pasadena-centered base into the Jewish community and, haltingly, into black and Latino Los Angeles. It was a way of making the paper, which was having trouble staying ahead of rivals, more of a profitable, mass-market product. The latter effort never really worked well, despite many efforts after the 1965 Watts riots exposed the fact that Times had not a single black reporter. The media industry, through most of those years, was a white man’s game, slow to include minorities and women. The effort continues today with mixed results. As the new century began, the rise of the Internet dealt a severe blow to the Times and the other big metropolitan papers. Circulation dropped, as did advertising and the size of the staff. Meanwhile, the subscribers on my street dwindled to a few. Who today even remembers the urban myth about the Times Sunday paper being so big that it once killed a small dog when the carrier tossed the bulky package on the porch? The Chandlers’ sale of the paper to the Tribune Company was followed by a disastrous acquisition by a vulture capitalist, Sam Zell, then bankruptcy, and reversion to its present ownership. Are the old aspirations of media that can connect Southern California dead? Not entirely, because Los Angeles recently experienced a revival of the old media spirit, and we were reminded of how much we’d missed it. Austin Beutner, a former investment banker turned civic leader, became publisher of the Times last year and declared that even the diminished paper had a duty to the community, to improve the Southland. He emphasized digging into local government and politics, revived and added to the California section, and kept up the Washington bureau and coverage of the rest of the world. It remains to be seen where Los Angeles will find, once again, the media it needs. Bill Boyarsky, who retired as city editor of the Los Angeles Times in 2001, is a political correspondent for Truthdig and is a lecturer in journalism at the University of Southern California’s Annenberg School for Communication.This essay is part of Is L.A. Still a City of Big Dreams?, a project of Zócalo Public Square. *Photo courtesy of Kevin Pedronan.